Nizhniy Novgorod region - Kstovo – August 6, 2012 – Installation of equipment, unique in its class, designated for dichloroethane synthesis (EDC), one of the main components for PVC production, has been completed at the construction site of the Integrated PVC production complex. The oxychlorination reactor, - weight is 170 tons, length is 21.1 m, diameter is 5.5. m -, was initially delivered by water to Mikhalchikovo Kstovo port, then it was transported to RusVinyl LLC construction site, to Kstovo promzona, by means of special machinery. 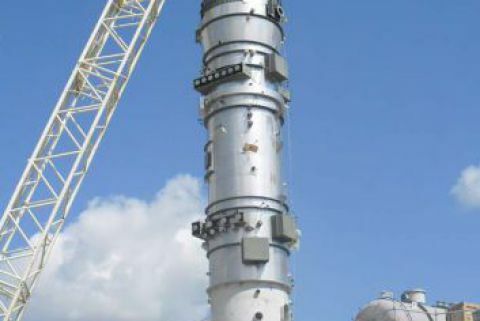 RusVinyl LLC PVC project director, Boris Slutskiy, emphasized that the installation works, despite the task complexity and big dimensions of the reactor, were executed with minimum time expenditures: «It took 3 hours 20 minutes to put the equipment in vertical position and to install it on the foundation. 2 cranes of 500 and 250 tons of cargo-lifting capacity were used to lift the oxychlorination facility. Now, the reactor has occupied its place at the VCM production area». Currently, more than 120 units of equipment, including 19 oversized equipment and heavy equipment, have been installed at RusVinyl LLC.